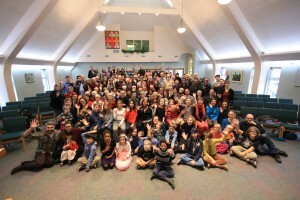 Referred to affectionately as “TUM-See,” Toronto United Mennonite Church draws people of many backgrounds from across Greater Toronto: families, single adults, seniors and kids. We share our building with our partners: the Spanish-speaking Toronto Mennonite New Life Church and the Mennonite New Life Centre of Toronto, which helps immigrants and refugees. We are heirs of a 500-year-old movement called Anabaptism that arose during the Protestant Reformation. It stresses personal commitment to Jesus Christ, following him as a role model for daily life, a shared life of community and service, rejecting violence, and pursuing peace and reconciliation as a central purpose of God’s people. We try to live out those values in an urban, postmodern context. We welcome people of all races, ethnicities, sexual orientations, gender expressions, faith backgrounds, physical capacities and gifts. Although we don’t always agree with one another, we share a belief in Christ and a desire to be his followers. Wherever you are in your spiritual path – skeptical seeker or committed Christian – we invite you to journey with us as we strive to to live with integrity as a just and faithful Christian commu nity.